Francesca Gagliardi is an Italian artist, working predominantly with plastic. As a sculptor, she focuses on themes of feminine power and fragility, expressing the strong ambivalence between these two notions. Gagliardi uses objects which express femininity – such as lipsticks, lace and perfumes – and transforms them into objects of war and battle. Francesca Gagliardi was born in 1972 in Novara, Italy. She graduated in Illustration from the European Institute of Design in the city of Milan and in Plastic Arts from the Fine Arts Academy, Brera. Later, she improved herself in engraving at the University of Ghent in Belgium and at the University of Complutense in Madrid. 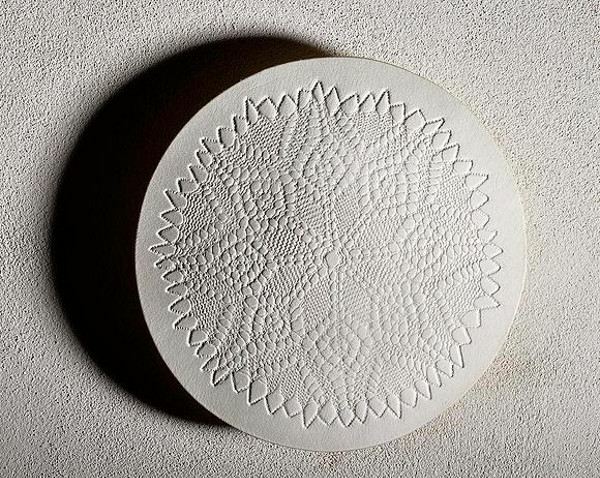 Afterwards, Francesca worked for three years in the engraving workshop Atelier Quattordici – grafica Upiglio in Milan. With subtle irony and sometimes provocative, the art of Francesca Gagliardi exposes stereotypes and symbols of femininity in the modern society. Using warlike symbolism, she questions the position of a woman in the contemporary world. Working with iron, bronze, aluminum and plastic, Francesca Gagliardi’s arsenal of weapons consists of lipsticks that turn into bullets, spears, helmets, and iron shields decorated with lace-like patterns. 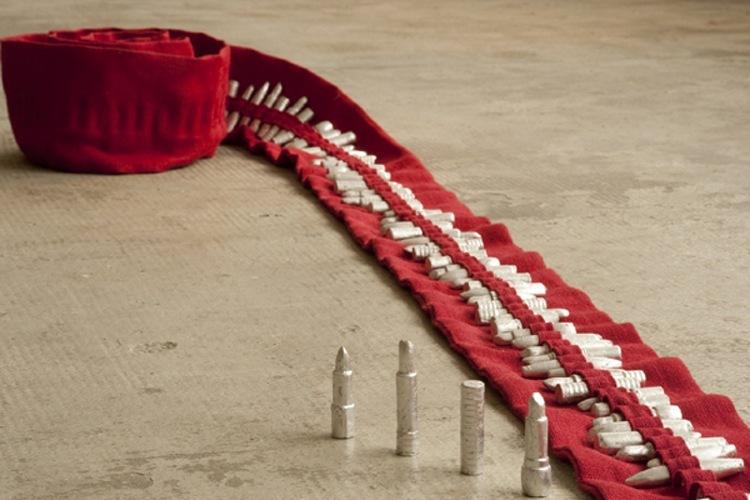 In the artist’s world, box of bullets becomes a makeup case, text fragments show a double meaning when faced with the mirror, soft and seductive red lipstick becomes a sparkly cartridge. Laces and embroideries created by the previous generations of women are transformed in metallic shields, and now serve as a symbol and flag of an Amazon ready to fight for herself. Mainly inspired by the book written by Chinese general and philosopher Sun Tzu, Francesca Gagliardi created her best-known series of works, named after the book – The Art of War. Francesca Gagliardi has been exhibiting her art since her first solo show in 1999, held in Galleria d’Arte Derbylius, in Milan. From that time on, her works have been featured in many group and solo exhibitions, in venues such as Galleria 41 in Torino, Gallerie Poonberg in Rotterdam, and other galleries in Valencia, Genoa, Milan and Paris. Gagliardi is currently represented by the Galerie Geraldine Banier, based in Paris. Francesca Gagliardi lives and works in Ameno, Italy.